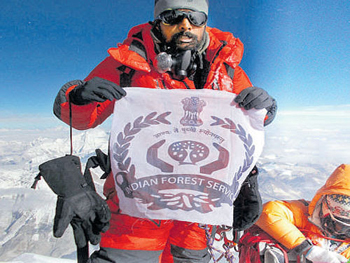 Udupi, Oct 09, 2017: In deed it is blessing for Udupi, Prabhakaran, the first Indian Forest Service (IFS) officer to scale Mount Everest in 2016 (May 20), has taken charge as the Deputy Conservator of Forests (DCF) in Udupi. A BSc (Forestry) graduate from Forest College and Research Institute at Mettupalayam and 2011 batch IFS officer from Tamil Nadu, he has earlier served as RFO in Virajpet, assistant conservator of forests (ACF) in Dharwad and DCF in Koppal before taking charge in Udupi. A regular trekker, the 30-year-old officer is planning his next expedition to 8,210 metre-high Mount Cho-Oyu in Tibet. A black belt in Karate, he is also a kabaddi, cricket, football and basketball player. A born-asthmatic, Prabhakaran took to rigorous activities after a doctor told him that asthma is not curable but can be kept under control by ensuring good physical activities. “Physical activities, including kabaddi, karate, football, cricket kept me going strong,” he said and added that initially, he was not keen on trekking but got to head the hiking club in college which led him towards mountaineering. “I dedicate my success to all the frontline staff of the Forest department, who work hard day and night to save forests,” says Prabhakaran. We have to be dedicated and this will help us to reach the destination very easily.